What you have been looking for... Quick release fittings that allow the use of barbed or schedule 40 fittings. ENHANCED SAFETY - Exclusive Cam Lever Locking Mechanism helps to reduce the possibility of unintentional opening of the cam levers, which could result in personal injury & costly spills. SMOOTH SEALING SURFACE - Parting lines have been removed from the sealing area of the male couplings, reducing the possibility of leaks and wear to the rubber seal. 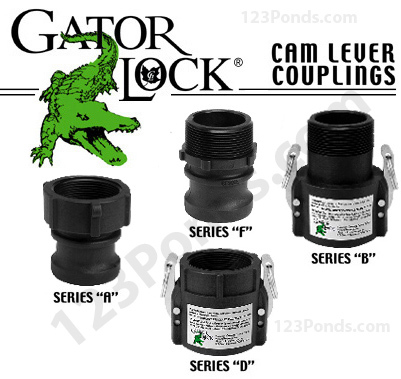 Warning: Cam levers should not be operated under pressure or with liquid in the line.